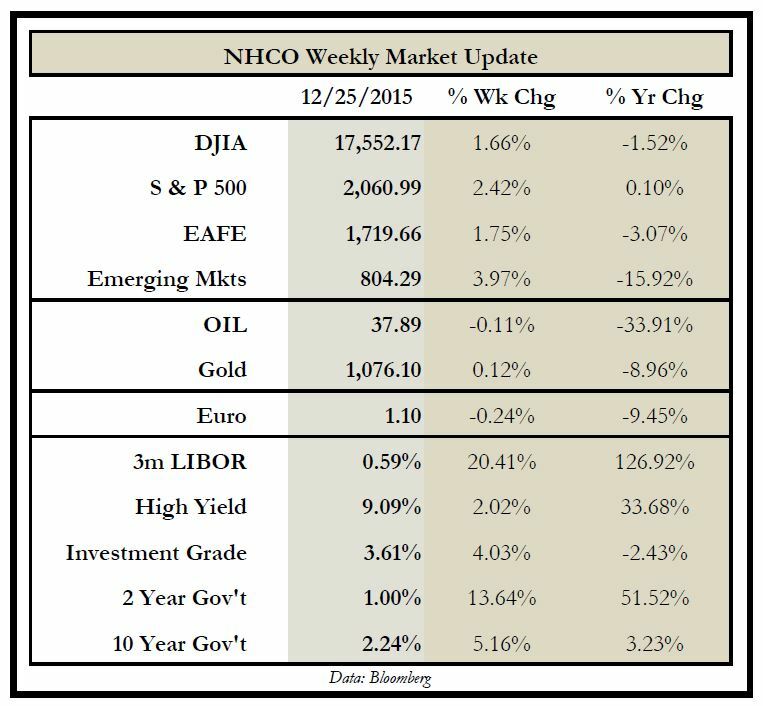 2015 | Nicholas Hoffman & Co.
A trade shortened week with Christmas on a Friday and the traditional early close on a Thursday created very little in market action worthy of commentary. However, conversation and observation were nonetheless present, just in a different but perhaps more insightful way. With all the reunions of families these past several days, I found many cases where young adults had migrated home from their new places of work. I decided that while attending the usual social functions to celebrate the season that I would pay closer attention to what was going on in these young people’s lives. It was time to engage them for their color on what they see and where we are at the end of 2015. All the conversations were had with people who are under the age of twenty-eight and mostly single. This informal and diverse group of men and women all had interesting jobs and views on their futures. All I had to do was ask one simple question: “what you are up to these days?”. The first conversation was with a young, twenty-four year old man who is embarking on a career in the business side of music. He wants to represent songwriters in helping them get their music recorded by “named artists”. He currently represents three unknown songwriters in Nashville and discussed both dealing with the artist’s passion for their song and the more business end of finding a buyer. He lives in a world where every song is a potential hit in the hands of the right performer and yet everyone knows the odds are thin. The next conversation was with a young woman just starting to teach 7th grade English at an all boys prep school. I asked what the difference was between teaching only boys versus a co-ed class? “I can’t imagine teaching 7th grade girls, they’re impossible.” But what about the boys? “Much easier, they don’t have the distractions of the girls.” Of course! Another conversation surrounded a 4th year medical school student who had just finished a rotation in the ER at Grady Hospital in downtown Atlanta. To think of this petite blond working on gunshot wounds at Grady is frightening as well as inspiring. Two budding young real estate professionals live in my home city of Atlanta where so many have made fortunes building and developing. They enter a year where the skyline is now littered with construction cranes riding yet another boom time in real estate. Just get these two some capital. Another woman is a San Francisco-based headhunter searching for talent in the ever-evolving tech community. She is tooling about town on their newest travel option call SCOOT. A clean energy, electric charge scooter system that allows members to drive all over the greater San Fran area for $25.00 a month. There was another medical school student who recently delivered her first child in a hospital in Vidalia, GA. It’s hard to match the accomplishment of being the first person to touch a new life. So many conversations and observations from our young adults at the starts of their careers. As we end 2015, the ideas and hopes of this new generation coming is exciting. These young people were optimistic, engaging, and eager about where they are and what they are doing as we start 2016. Perhaps we should all look into the future through their eyes as we close this year out. Happy New Year to each of you. This entry was posted in The Weekly and tagged Young Minds on December 28, 2015 by nhoffmanandco.